I had power, I was respected, but not any more. Last week, I was at peace with the world. Birds chirped merrily amongst the trees, twittering away as the sun glistened down from the crisp, blue sky. Fallen cherry blossom petals danced majestically through the air, guided by a wonderfully calming, cool spring breeze. Passers-by, who usually appear hurried and stressed, seemed strangely relaxed, with a spring in their step and a warm smile across their faces. But all of that was irrelevant. The reason behind my new buoyant outlook on life was quite simple: I had managed to secure a commanding lead over Rhys, our Deputy Editor, on Mario Kart 8. And that felt absolutely terrific. So good in fact that I began to take quick snapshots of our head-to-head scores after each heated encounter and proceeded to send the pictures to Rhys at the end of our session, rubbing copious amounts of salt into any wounds that may have been opened during the race. That figure later rose to 117-101 at one point. Yes, life was good atop the Mario Kart throne. I was the supreme, undisputed king – a hero some might say – and my confidence was at an all time high. It was only natural, then, that I decided to test my karting prowess online against the world at large. With the winds of victory behind me, I set sail for a greater challenge in the hopes that I would find an able rival. And that’s when I met the Japanese player Kinopio… an encounter I thoroughly and bitterly regret. Kinopio (キノピオ) was an imposing presence from the outset. With a staggering points total of 29,942 compared to my measly 1,811, I knew I had my work cut out for me. 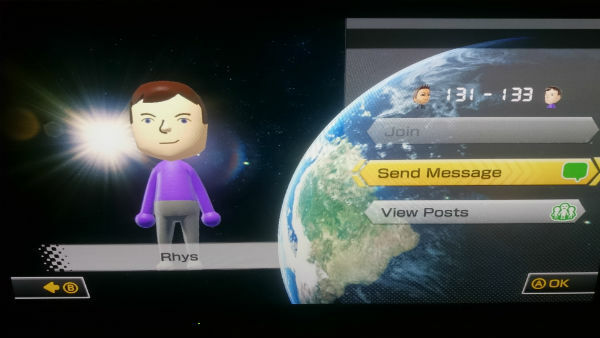 He even had an expertly designed Mii that made it look as though he was an anime character. Nevertheless, this was exactly what I’d been looking for. If there was ever a monumental mountain to climb then this had to be it. I vowed that I would beat Kinopio on that day, no matter what the cost; after all, my ego demanded it. Blurry, photographic evidence that Kinopio exists. Race after race flew by, and with it came another crushing Kinopio win. I was close, but no where near close enough if I was to steal first place. I watched in dismay as Kinopio quickly pulled away from the chasing pack, cursing the other racers behind me as they interfered with my noble quest. His combination of Toad (whose name is Kinopio in Japan), Cyber Slick tyres and the Sport Bike gave him the agility of a seasoned gazelle, an expert at escaping the clutches of any nearby predators. I was the predator, and I found myself utterly beguiled by the beauty of my new rival’s ability. But there was one sticking point I couldn’t shake. Even though Kinopio was clearly a master of his craft, his overall top speed far exceeded what his kart setup could possibly provide. He also appeared erratic on screen, almost glitchy as he drifted and jutted around the track. Something wasn’t quite right, but I put my paranoia to one side and hatched a plan that would even the odds. 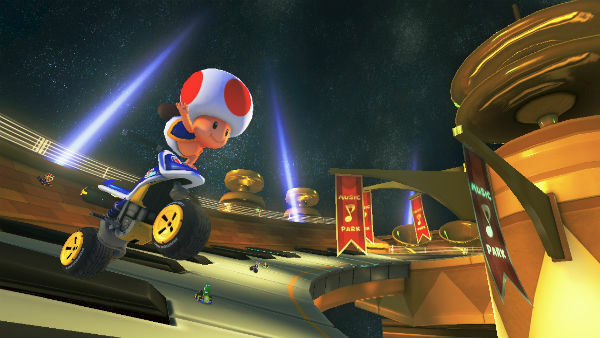 In Mario Kart 8, some tracks are wide-open. 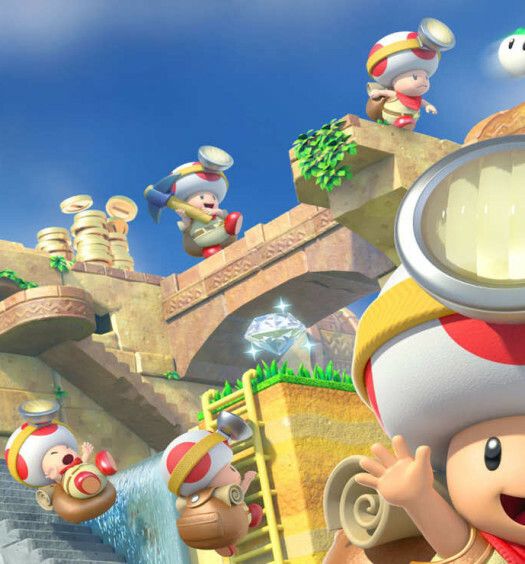 These include the recent additions of Baby Park and Excitebike Arena, where it’s nigh on impossible to pull away from the chasing pack – even novice players have the chance to sneak a victory. I knew that if I could get Kinopio on one of these tracks, my chances of winning would go up to at least 32.33% (repeating of course). And I liked those odds. I could almost taste his frustration – and it was absolutely delicious. As luck would have it, Mario Kart 8’s roulette wheel of selectable tracks answered my prayers. Baby Park was the first to come up, and it signalled a shift in power as Kinopio lost his first race after multiple wins on the bounce. But I wasn’t the victor, sadly. I was left languishing in 4th after suffering a horrific triple tap: red shell, green shell, and a Bullet Bill all in the back, one after the other. My frustration didn’t last long, though. The next race that popped up was Excitebike Arena. And I was ecstatic. “This is it! Your time’s up, Kinopio!” I yelled bullishly, my belief strengthened by the fortunate track rotation. I quickly glanced at the mini map to see where Kinopio was hiding. And there he was, struggling at the bottom of the pack. I could almost taste his frustration – and it was absolutely delicious. In the blink of an eye the race was over, and I was victorious. I leapt into the air and proceeded to perform an impromptu jig of celebration. I had finally done it, but part of me knew deep down that this wasn’t the victory I was hoping for. I was determined to beat him fair and square, on a less open track. Little did I know that my next race, Yoshi’s Circuit, would change everything. It would be trolling of the highest, most inflammatory calibre. As the final lap came around, a blue spiny shell came hurtling past. 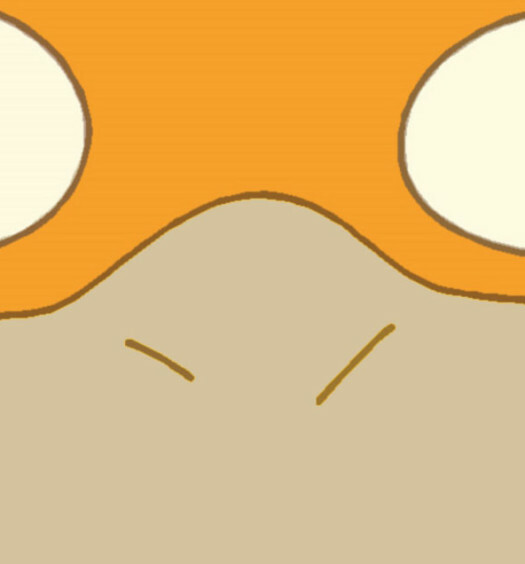 I anxiously watched the mini map to see if Kinopio’s icon would spin out – to my relief, he had been hit. But I still had work to do, and time was running out. As I drifted around the second to last corner, I was stunned to see Kinopio laying in wait. He was armed with a super horn, and I knew exactly what he was going to do: he was going to use the super horn on me, and then drive over the finish line. It would be trolling of the highest, most inflammatory calibre. But Kinopio’s arrogance proved to be his downfall. I hadn’t entered the fight empty handed; I was carrying a green shell with his name on it. Still, the odds were stacked in Kinopio’s favour; he could easily destroy the green shell using the super horn, and still clinch victory. I had to act fast. I fired the green shell straight and true; its short journey felt like an eternity. Thankfully my aim was dead on, and I let out a small yelp of glee as the shell planted into the backside of Kinopio, who in his surprised state, impromptly fired off the super horn and missed my kart by a supersonic millimetre. 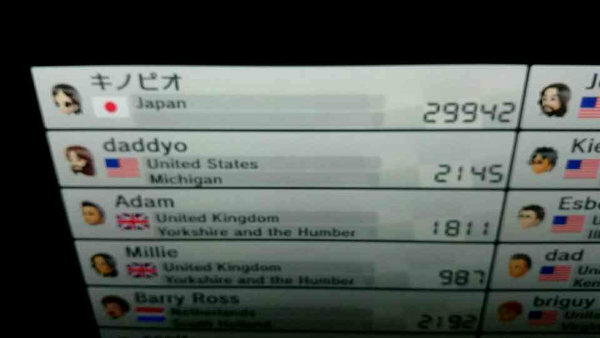 The finish line was mine – I had not only beaten my new nemesis, but I had outsmarted him too. I couldn’t have been happier, I had vanquished Kinopio, but unfortunately my celebrations were rudely cut short. “What? What the hell. No. No, no, no!” I had been kicked from the game just as I passed the finish line. Was this Kinopio’s doing?! It must have been. It can’t have just been a cruel coincidence – there was nothing wrong with my connection. Angry and annoyed, I repeatedly tried to rejoin Kinopio’s lobby. But I couldn’t get in, no matter how hard I tried. No bother, I thought, I had accomplished what I set out to achieve. It was now time to extend my lead over Rhys, and further cement my name into the annals of Mario Kart 8 history. Kinopio could wait. But something wasn’t quite right. To my horror, Mario Kart 8 had started to forsake me. To paraphrase the words of Randy Newman, “Strange things were happening to me, ain’t no doubt about it.” Every item I obtained was practically useless for my current position. Every CPU racer suddenly had a Godlike ability and an unnerving agenda to take me out. Courses that I had driven and conquered a hundred times felt foreign and disturbingly new. And every race kept ending the same way: Rhys would win. Comfortably. I couldn’t take it. I wasn’t doing anything differently and – apart from a few well-timed reverse shots – neither was Rhys. And yet there he was, dominating, comfortably clinching victories one after the other. It felt like I was taking crazy pills. “Rhys, man, something isn’t right here.” I tried to explain, without sounding too salty. “What’s up, man? You got a bit of lag or something?” Rhys sympathetically replied. “Sounds weird, dude. Do you want to host the room?” Suddenly Rhys’ sympathy carried a patronising tone. “Seriously! This is messed up. I can’t even get close to you in any race!” I yelled, as my frustration began to boil over. I wanted to rage quit life. So we switched rooms. I changed characters. I disconnected. I chose races that I knew I had been victorious on almost every occasion, and yet, just like how the sun rises in the morning and sets in the evening, nothing changed. Rhys kept winning, and I kept being royally screwed over by every possible thing imaginable. How things stand after a string of debilitating loses. Today, one week after beating Kinopio, I’m no longer the king of Mario Kart 8. 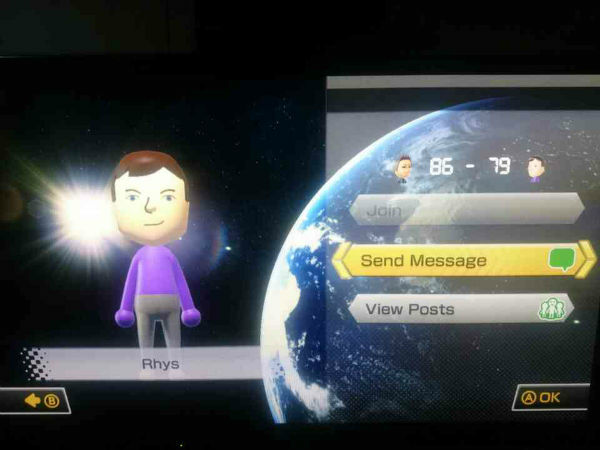 My head-to-head record makes for grim reading, as Rhys now sits atop the Mario Kart throne, giggling away as he pips me to the post every time. To be honest, I don’t know where I’ll go from here. Everything I believed in suddenly feels like a lie. Nothing has changed, and yet everything has. But I know one thing for sure: the curse of Kinopio is real.